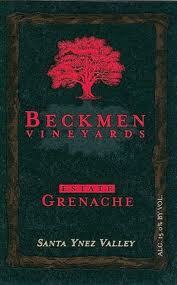 Beckmen Vineyards is a family-run estate winery located in Santa Barbara County's Santa Ynez Valley. It's truly in my opinion one of the better producers of Rhone varietals in all of California. Their Estate Grenache is 100% Estate fruit from their Purisima Mountain Vineyard. It's also 100% Grenache and was aged for 15 months in neutral French oak. On the nose I get aromas of red raspberry, strawberry rhubarb pie, graphite and mineral, and wet asphalt. The wine is actually quite terrior-driven on the nose and shows lots of mineral and stone character. There is a just a pinch of alcohol that peeks through on the bouquet as well, which is actually quite unfortunate.